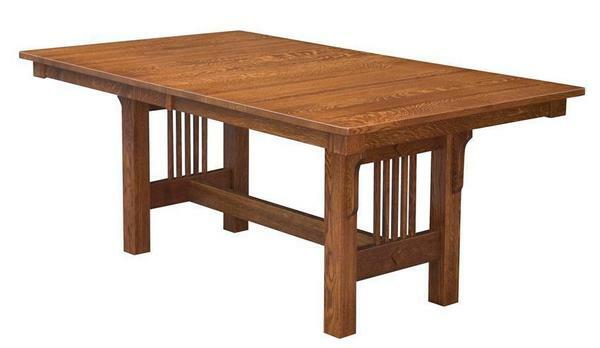 DutchCrafters Amish Mission Trestle Table is carefully crafted by hand in a small woodshop located in the rural town of Shipshewana, Indiana. By strategically selecting the finest hardwoods, the trestle table is constructed for strength and durability for generations of sustainability. Many wood and stain options are available to satisfy any look and desire. For functionality, the Mission trestle table offers a plethora of sizes to choose from, and up to four skirted, self-stored extensions for added length. Complete the set by adding Amish mission dining room chairs, or by adding an Amish mission trestle bench. And if you are unsure about the choice of stain, give us a call and we will be happy to send out some samples! Please call one of our Amish furniture specialist with questions, customizations or ordering assistance at (866) 272-6773.